Hibernate provides alternate ways of manipulating objects and in turn data available in RDBMS tables. One of the methods is Criteria API which allows you to build up a criteria query object programmatically where you can apply filtration rules and logical conditions. The Hibernate Session interface provides createCriteria() method which can be used to create a Criteria object that returns instances of the persistence object's class when your application executes a criteria query. Following is the simplest example of a criteria query is one which will simply return every object that corresponds to the Employee class. public Criteria setFirstResult(int firstResult) This method takes an integer that represents the first row in your result set, starting with row 0.
public Criteria setMaxResults(int maxResults) This method tells Hibernate to retrieve a fixed number maxResults of objects. The Criteria API provides the org.hibernate.criterion.Projections class which can be used to get average, maximum or minimum of the property values. The Projections class is similar to the Restrictions class in that it provides several static factory methods for obtaining Projection instances. 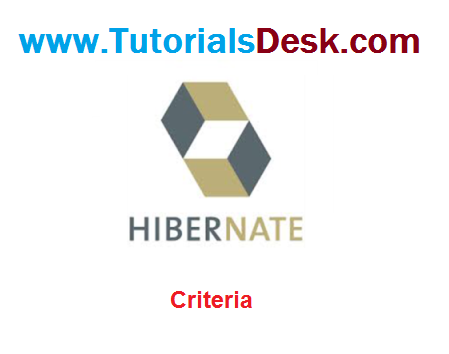 Hope we are able to explain you Hibernate Criteria, if you have any questions or suggestions please write to us using contact us form. (Second Menu from top left).